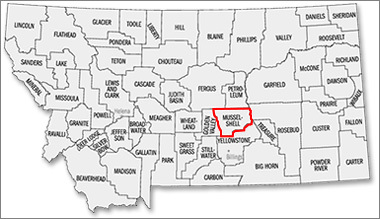 Musselshell County is located in south central Montana. Musselshell County encompasses 1,965 square miles. Topography ranges from rolling grasslands to the sand rocked, forested rough Bull Mountains. The Musselshell River traverses the middle of the county from West to East. Natural Resources are Coal, Oil & Gas, Timber. Cities and towns include: Roundup (the County Seat), Elso, Klein, Musselshell, Queens Point, and Melstone. 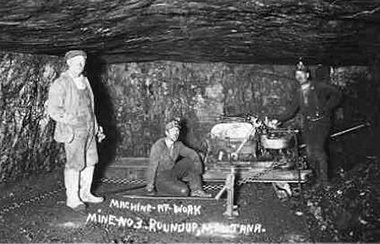 Coal mining is a historic industry in the Roundup area, with a revival in the 1990s with a far more automated Signal Peak Mine. Musselshell County was created February 2, 1911, by Governor Norris from portions of Fergus County north of the Musselshell River, portions of Yellowstone County south of the river and portions of Meagher County to the west. The name Musselshell comes from the mussel shells found in the river of which Lewis and Clark are credited with naming. Located in South Central Montana, Musselshell County is north of Montana’s most populated county, Yellowstone and south of Petroleum and Fergus Counties. 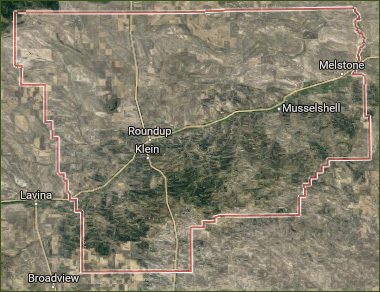 In 1915, Golden Valley County was formed from a western portion of Musselshell County. To the east, a portion of the border between Musselshell and Rosebud County is the northward sweep of the Musselshell River. The assessed value in 1912 was $19,000,000 with a population of 9,000. In 2018, the assessed value is $12,664,551 with an estimated population of 4497. 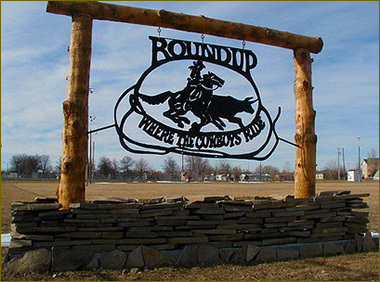 The town of Roundup, whose name comes from cattle roundups of the late 1800’s and first established in 1908, is the county seat. 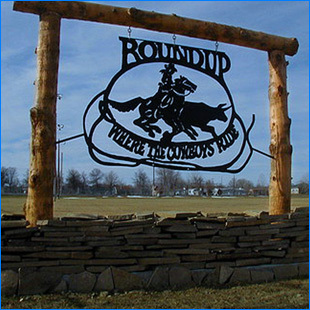 Roundup provides all services plus a local hospital and houses a Class B school. The small community of Musselshell sits 20 miles east of Roundup where the old school serves as a community center and the local church is still active with the post office next door. Melstone, once bustling with oil activity and now a rural agriculture gathering place is another 13 miles east providing basic services and a Class C school. 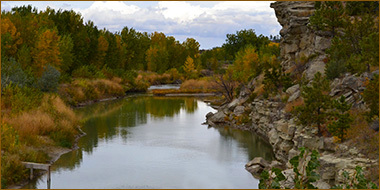 The Musselshell River runs through the county, supplying watersheds, wildlife support, famous fishing and irrigation. dry land farming development were followed with irrigation projects establishing Musselshell County as a rural agriculture county. The rail road rerouted the river and water projects, but provided transport for crops and brought people to the area because of the Homestead Act of 1920 for 160 acre tracts on federally opened land. Drought brought an end to this population and closure to many communities with schools like Bundy, Elso, Gage, Delphia, Absher and Queens Point. In the late 1960’s subdivision began bringing people to Musselshell County who wanted to live a country life, but work a job often not related to agriculture. This development continues today with many residents commuting to Billings. The Chicago, Milwaukee & St Paul Rail Road pulled out of the county in the late 1970’s. Coal mines began producing in 1908 and dwindled after 1956 with the last major mine closing in 1959. Mom and pop mines provided local coal for years. An underground mine south of Roundup struggled to resurge in the 1990’s, but finally grew back to full production in 2009 as the Signal Peak Mine with over 300 employees. Further coal has been tracked for development across the southern end of Musselshell County. Coal is now shipped by Global Rail over to Acton. Oil was first discovered in Devil’s Basin in 1919 and remained a steady economic factor in the northern tier of the county into the early 70’s. Small production has remained in the county ever since. Realization of the Heath formation under Musselshell County now sees activity working on how to tap it. Regardless of economic boom or bust, Musselshell County is a resilient and cyclical place. The Flood of 2011, described as a 100 year flood, the Fires of 2012 and another flood in 2013 have changed the face of the County physically. However, the people remain steadfast working with local government and industry helping one another to produce major rebuilding of roads, bridges and homes. The county’s courthouse is located in the county seat town of Roundup Montana.